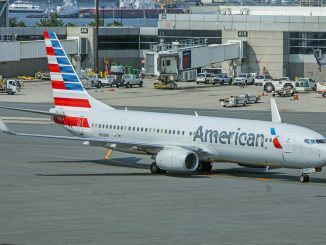 The airline responsible for the Airbus A220 being called the A220 instead of the Bombardier C Series has finally begun revenue service with the aircraft. 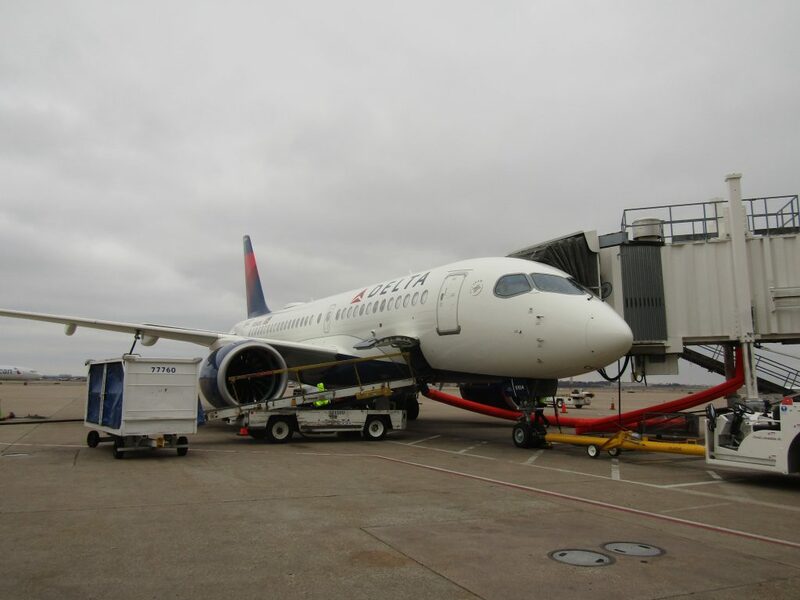 Delta Air Lines marked a new chapter in its 90-year history last week when it inaugurated a new aircraft type into its fleet, the Airbus A220. 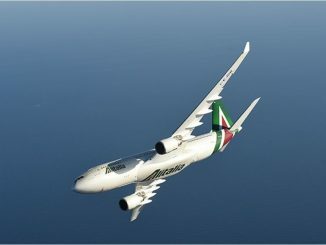 The 109-seat aircraft is one of the newest aircraft in the skies, though had mainly seen service in Europe with carriers such as SWISS and Air Baltic as well as Africa and Asia, finally making its way into North America with Delta being the first American carrier to operate the aircraft. Delta had ordered the aircraft in 2016, sparking controversy as Boeing claimed Bombardier had sold the aircraft to Delta at a steeply discounted rate, violating trade laws concerning dumping. Fearing tariffs being placed on the aircraft, Airbus stepped in and purchased the majority share of the program and vowed to shift production to the U.S. at its Mobile facility. 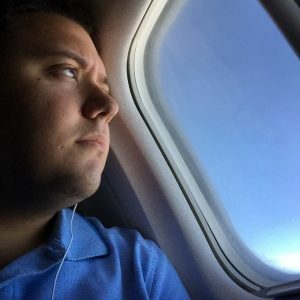 Although the U.S. government voted in favor of Bombardier, the Airbus name stuck and now the aircraft is known as the A220 instead of the C Series. Though its launch had been delayed by a week due to the U.S. government shutdown, its initial launch plans had remained the same. 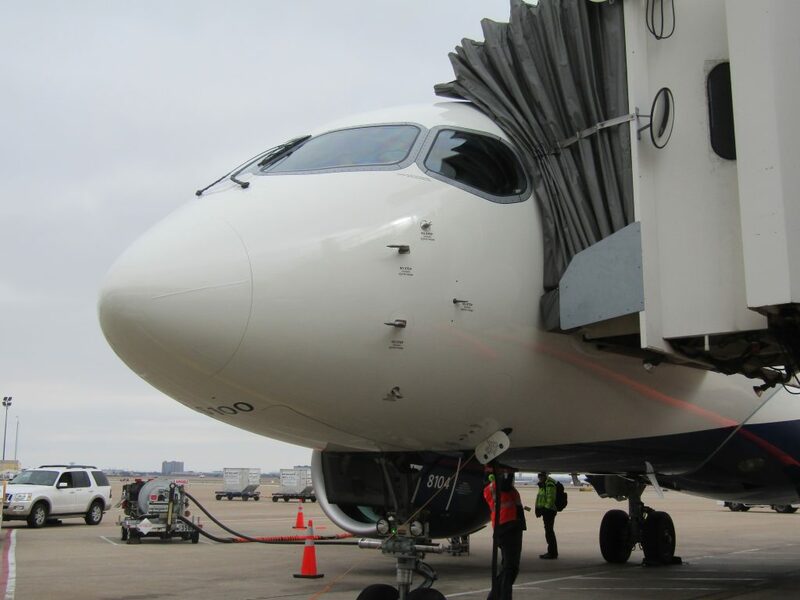 The aircraft would replace the Embraer E175 regional jet, operated by Delta’s regional partners under the Delta Connection brand, on two routes from New York to Boston and Dallas from Feb. 7. 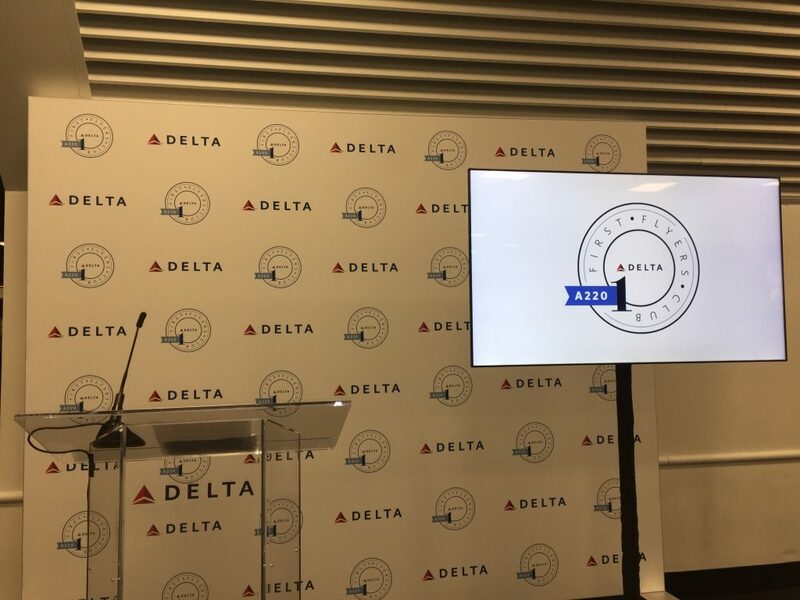 By the time the first flight departed from LaGuardia, Delta had already been putting the aircraft through the wringer, inducting a new pilot class to fly the aircraft and putting over 1,000 hours of flight time on. 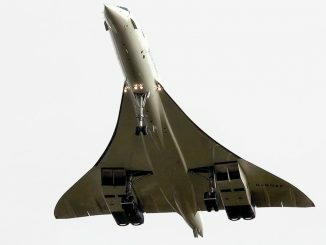 In the days leading up to the inaugural, the aircraft could be found flying back and forth between New York and Boston, ensuring the first flight with passengers onboard would go smoothly. As this aircraft was a completely new model, it was likely harder to break in than other types in Delta’s fleet since the pilots would have to start from scratch by getting new type ratings and training on the aircraft. 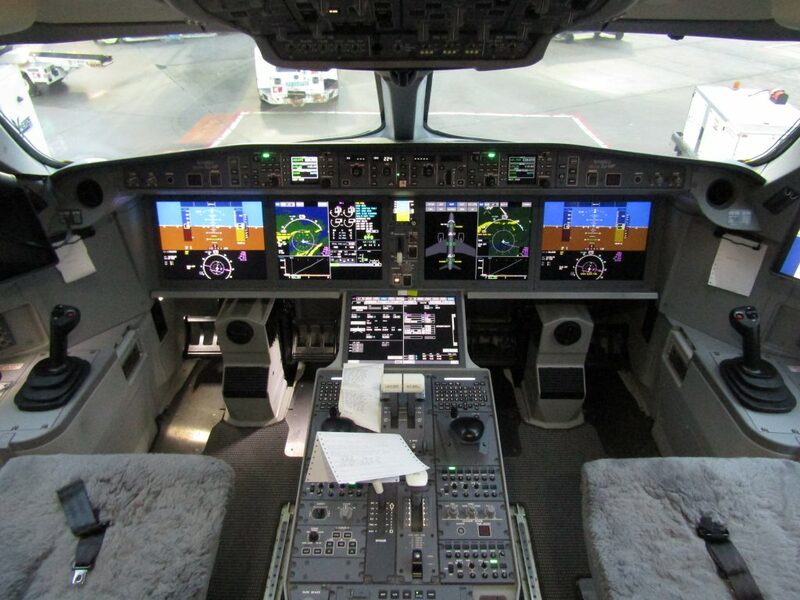 Though it bears the Airbus name, it doesn’t feature the near-universal cockpit layout that Airbus prides itself on for interchangeability between different aircraft types because Bombardier had designed and built the aircraft before selling the majority of the program to Airbus. The first flights were operated by the A220-100, the A220’s smaller variant, of which Delta has a recently-upgraded order of 40 aircraft. Delta expects to receive 28 of the type this year with the main pilot base being LaGuardia for the time being. The larger variant, the A220-300, will begin deliveries to Delta next year, with 50 of the aircraft on order to be delivered from the new A220 Final Assembly Line facility in Mobile, Ala., which AirlineGeeks toured last month. 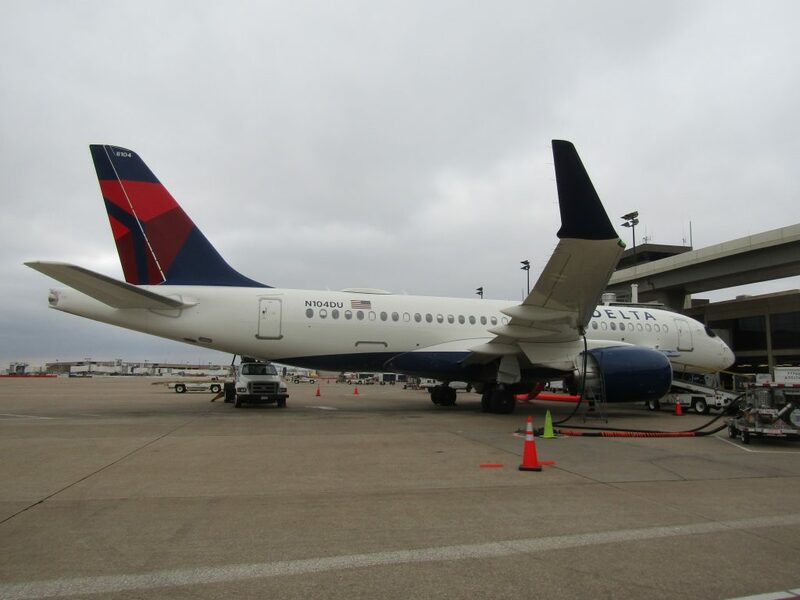 The first two flights of the aircraft both departed from Delta’s New York LaGuardia, currently under renovation to modernize the aging airport, to Boston and Dallas as DL 744 and DL 2952, respectively. 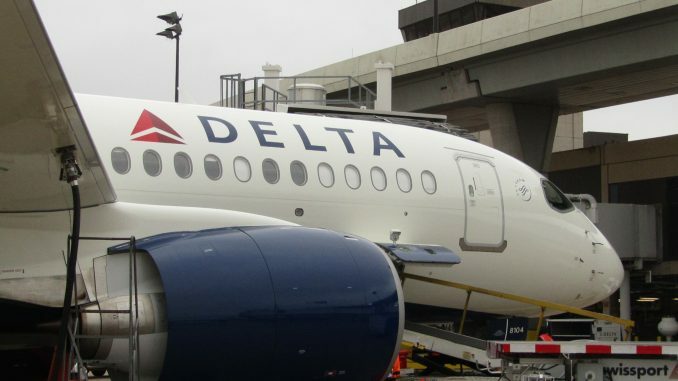 Boston is a popular destination for Delta from New York, with the service branded as the Delta Shuttle, while the Dallas route has mainly been operated by Delta Connection in competition with American Airlines which maintains hubs in both cities. 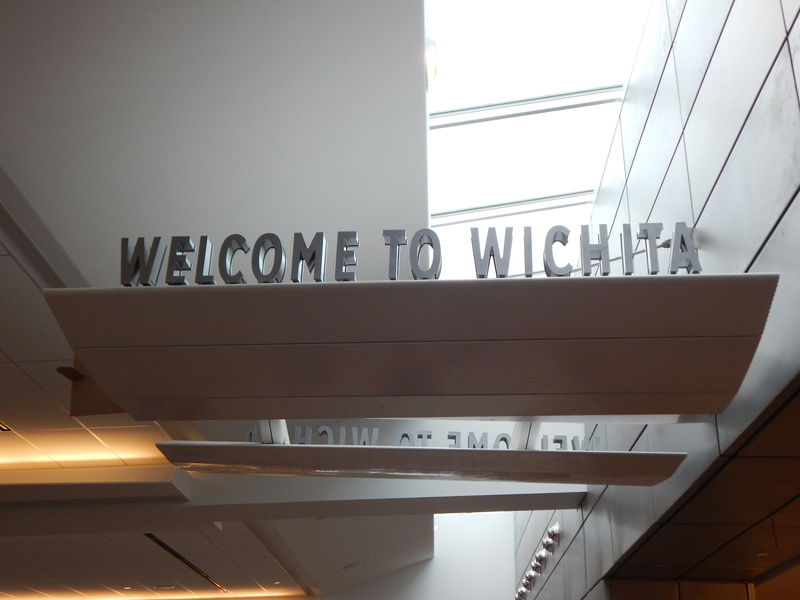 In typical inaugural flight fashion, passengers onboard both flights were a mix of regular travelers and those flying solely for the purposes of flying on the new aircraft for the first time. 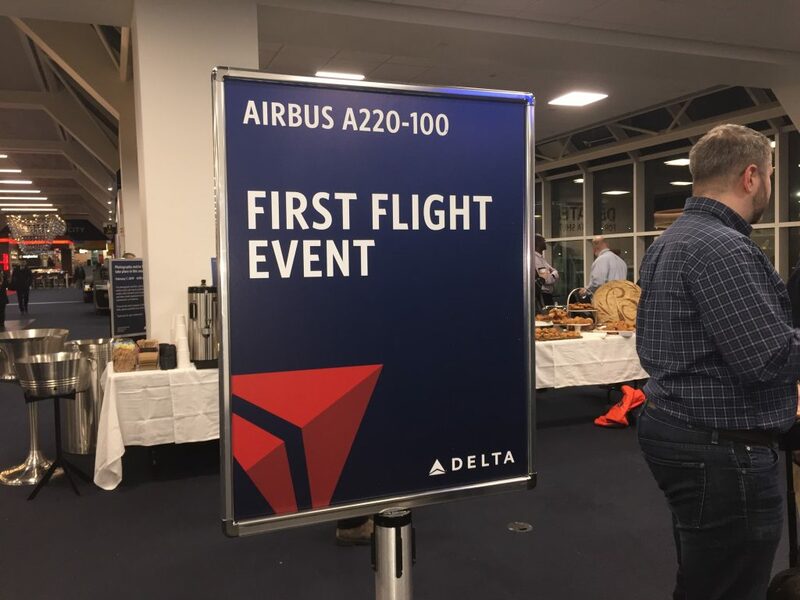 To celebrate the occasion, executives from both Delta and LaGuardia Airport were in attendance at the ripe hour of 5:00 a.m. With the flight to Boston scheduled to leave at 6:00 a.m., it was surely an early morning for all. The seven-day delay due to the government shutdown was made easier by Delta pre-emptively calling some passengers and offering them the opportunity to change their flights free of charge. 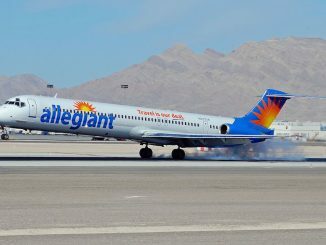 Even those in Basic Economy were allowed to change the date or even destination due to the delay. 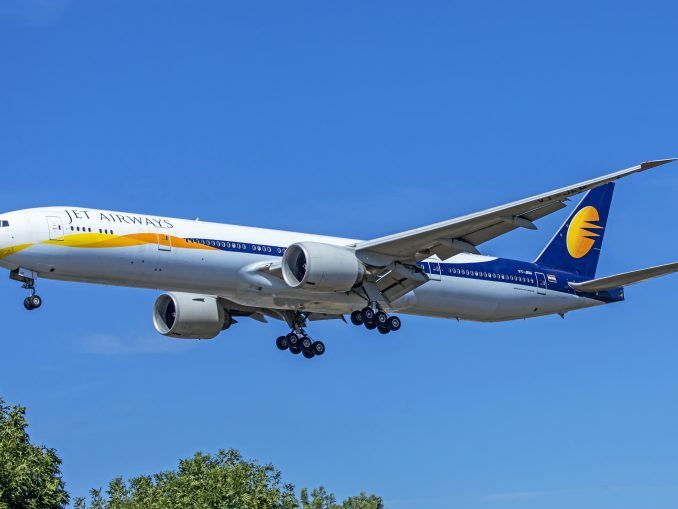 Though the delay was minimal, it wasn’t completely free from issue as some passengers originally booked on the first flight couldn’t attend the new date and missed out on the first flight. Travelers from all over flew to New York just to be a part of Delta history, including some from other countries. All onboard were brought together by Delta and this aircraft, strangers united by the common bond of aviation. 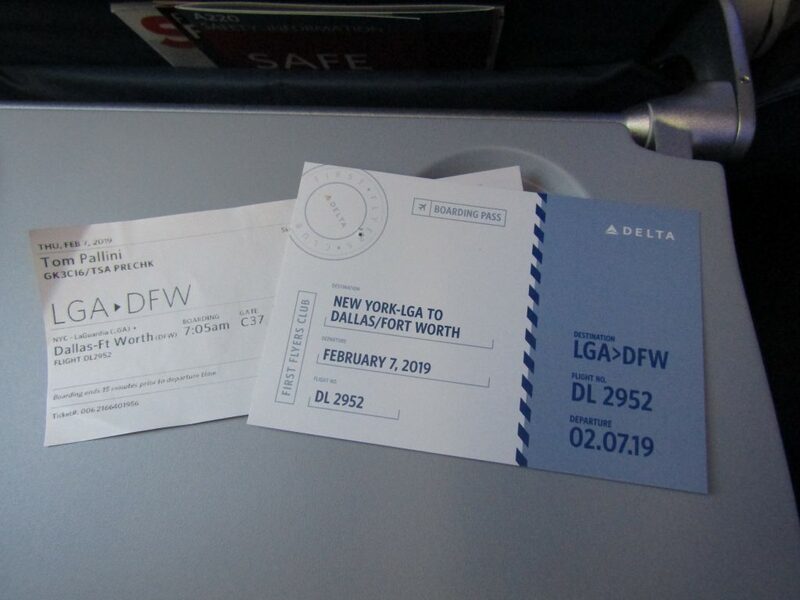 Commemorating this event, Delta issued all flyers on the morning flights placards congratulating them on joining the First Flyer’s Club and first flight pins. At 6:00 a.m., the first flight to Boston pushed back from the gate on-time with onlookers in the terminal watching on with joy. After a quick taxi to Runway 13, the A220 departed LaGuardia for the first time with passengers onboard and the era of the A220 at Delta had begun. 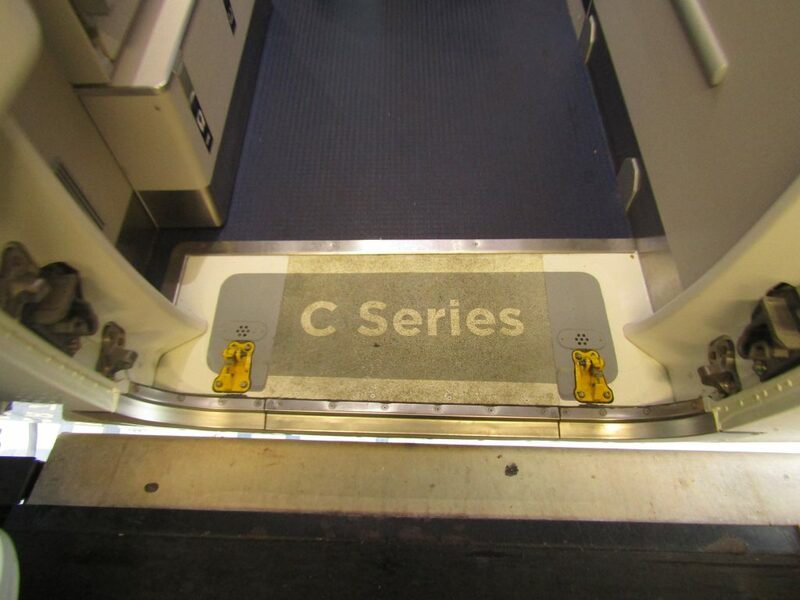 Immediately walking on the aircraft, one is reminded of the aircraft’s controversial past. 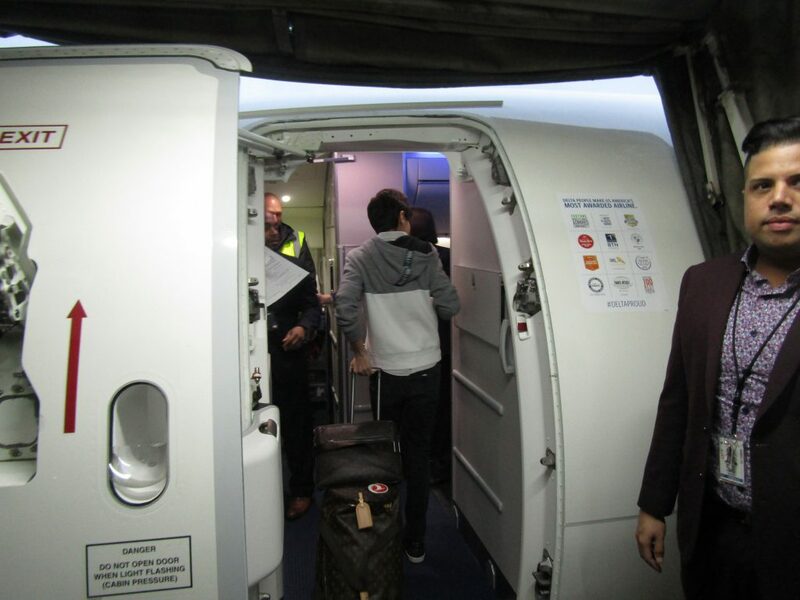 The placard at the boarding door still says “C Series” instead of “A220,” and the nose of the aircraft says “CS100.” In addition to a full-sized galley, the forward section of the aircraft features a storage space for coats and a lavatory for first class passengers. Peeking into the cockpit, one can immediately tell this isn’t your average cockpit. 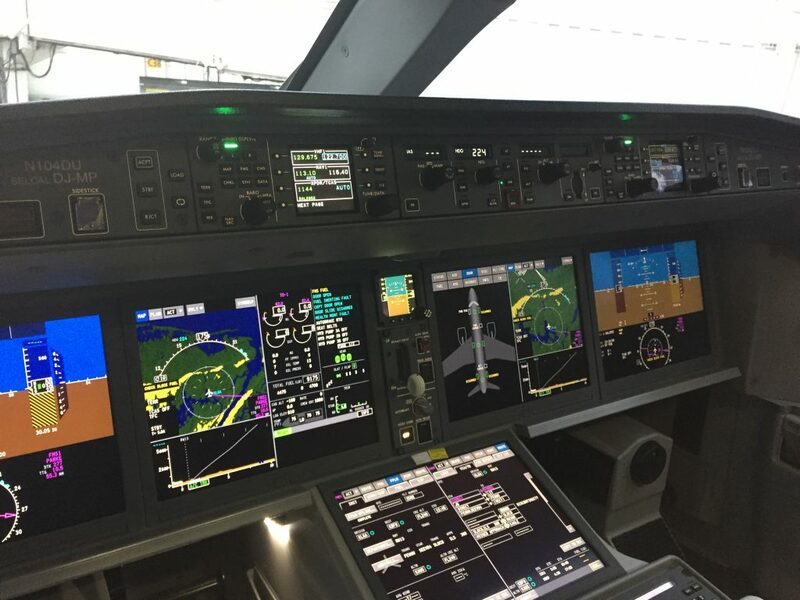 The entirety of the displays is glass, reminiscent of the Boeing 787 Dreamliner or Airbus A350 XWB instead of a 109-seat aircraft. 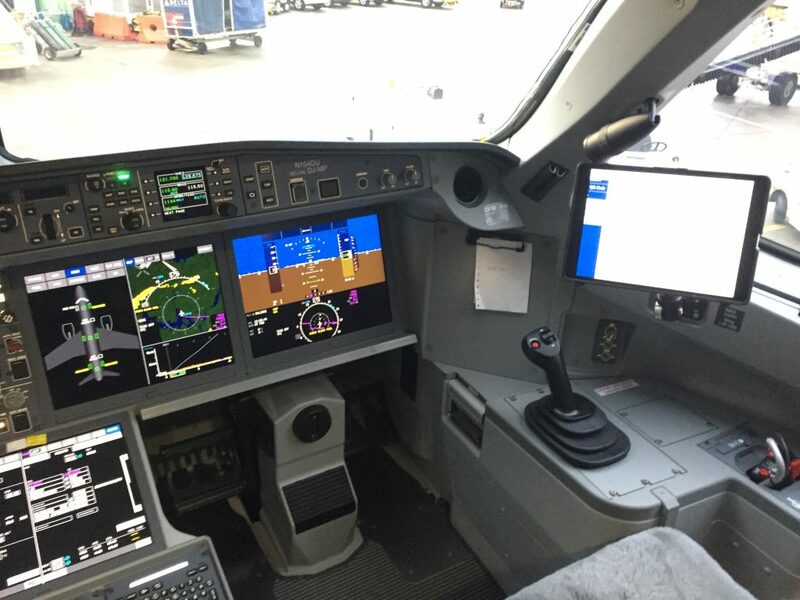 Although it wasn’t initially an Airbus design, the cockpit features sidestick controls, a staple of Airbus aircraft that Bombardier used on the C Series, a departure from its normal yokes found on other aircraft such as the Canadair Regional Jet or Dash 8 series of aircraft. 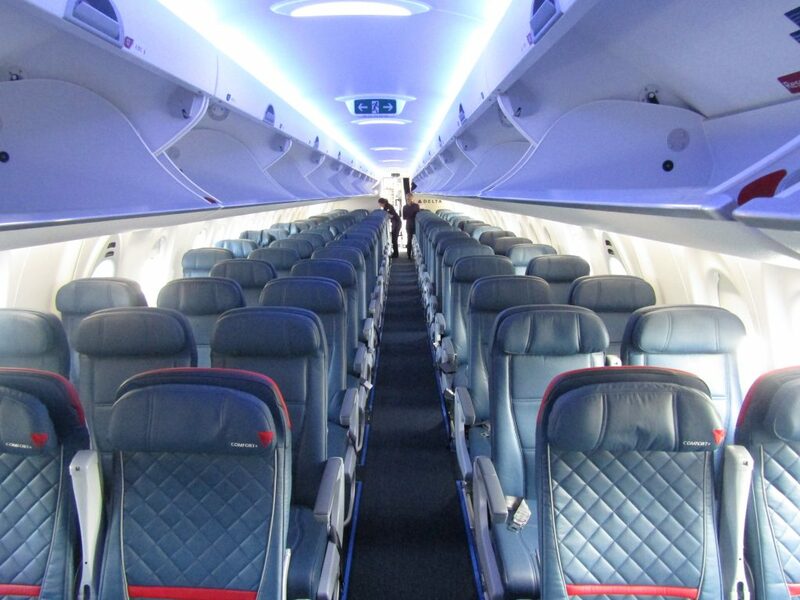 Moving back in the aircraft, Delta’s Airbus A220-100s feature 109-seats across two cabins, first class and economy class. 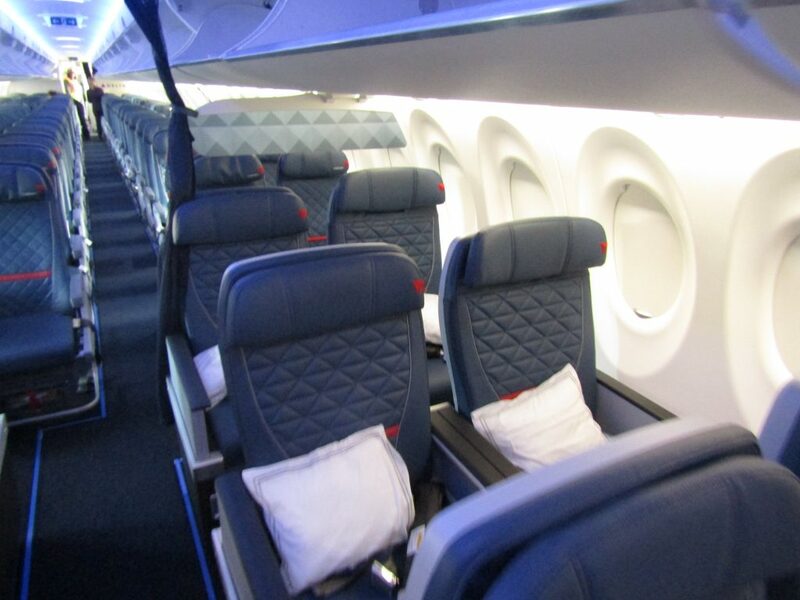 The 12-seat first class cabin was organized in a standard, 2-2 configuration, the same amount as a Delta E175 and A319. The recliner seats are standard but feature some upgrades such as a water bottle holder. 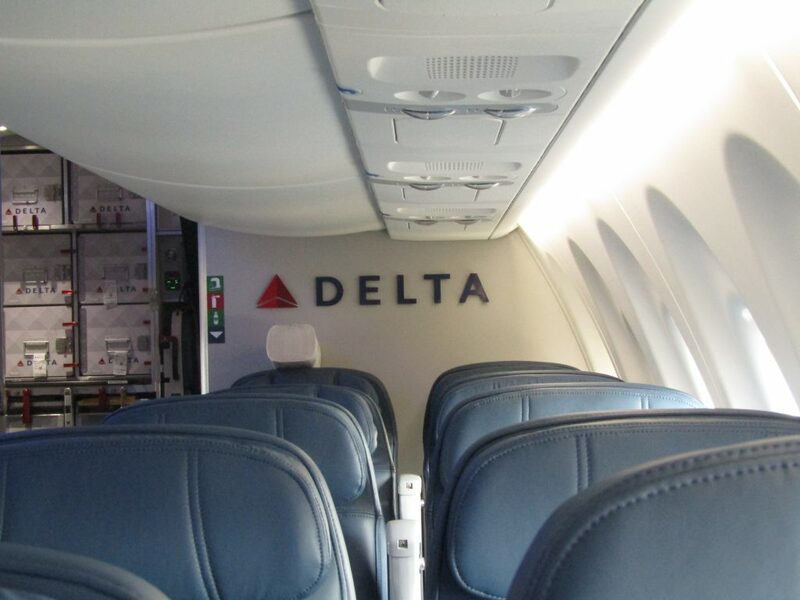 Economy on the A220 is most comparable to Delta’s Boeing 717 aircraft in terms of configuration and capacity with 97 seats in total divided amongst Delta Comfort+ and regular economy, one less seat than the Boeing 717, although both are in a 2-3 configuration. 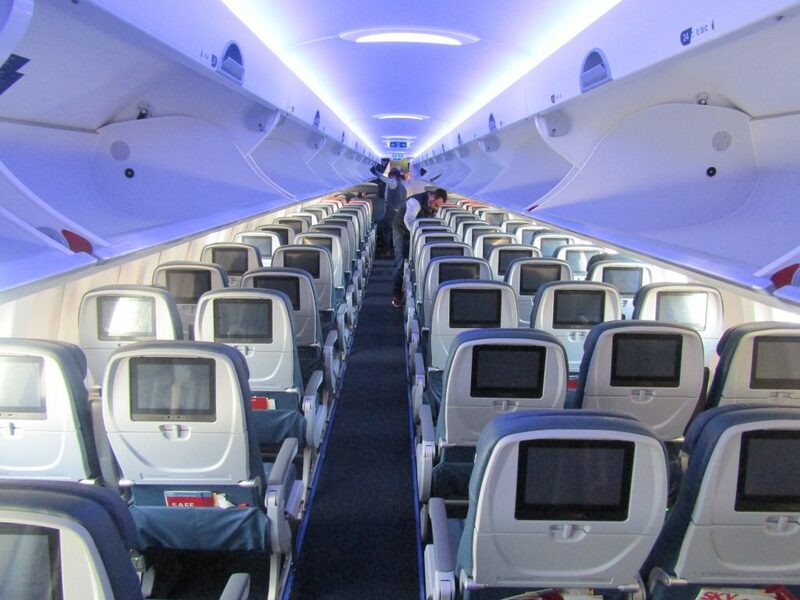 The main selling point of the A220’s cabin is the in-flight entertainment. 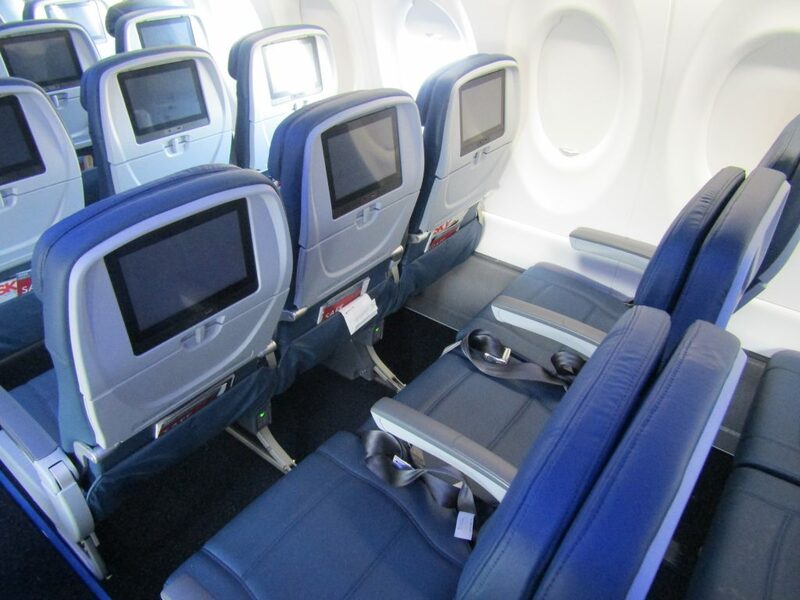 While most airlines are cutting back on seatback entertainment, Delta went all-in and every seat features personal in-flight entertainment screen loaded with movies, television shows, audio, a moving map and other features. 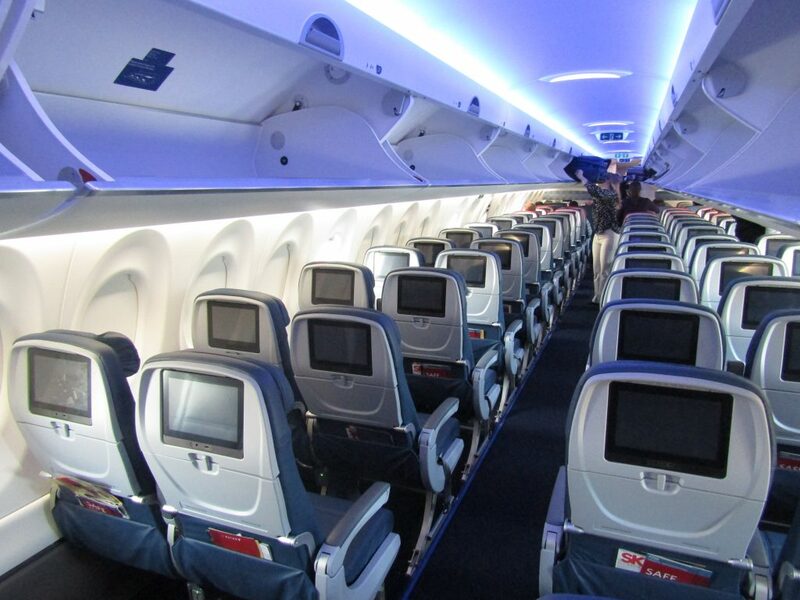 In addition, the A220 features WiFi through Gogo that allows for browsing and even additional streaming content. 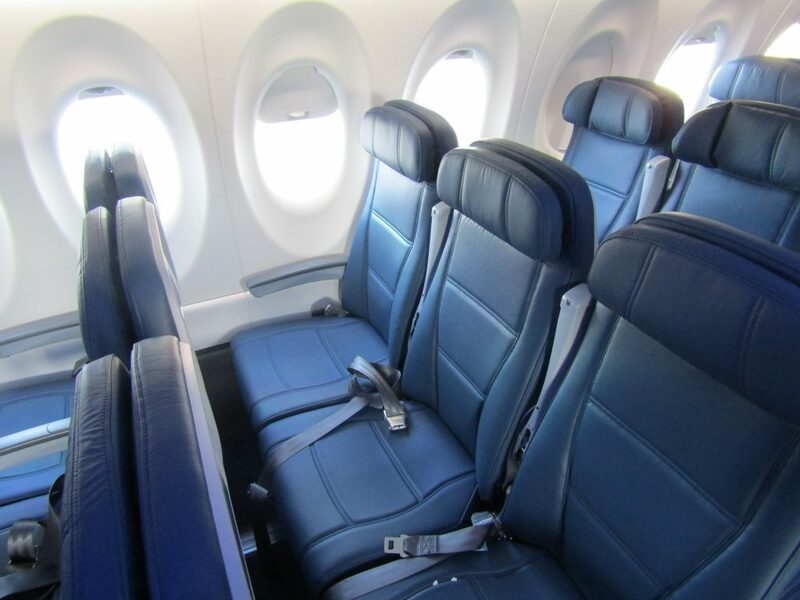 The A220 economy seats are some of the widest in the industry, coming in at 18.6 inches. Pitch varies but is estimated to be 30-32-inches, depending on seat location, according to SeatGuru. Each economy seat also comes complete with in-seat power via a shared 110v AC power outlet for the two-seat pairs and two shared power outlets on the 3-seat side. The outlets are rear facing and located in between the seats in front of you. 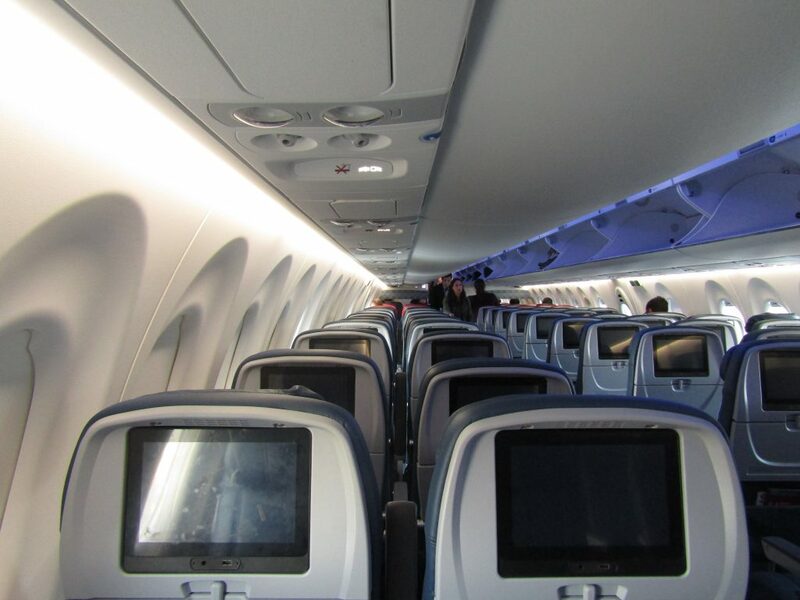 All seats do offer individual USB ports via the seatback in-flight entertainment screen. 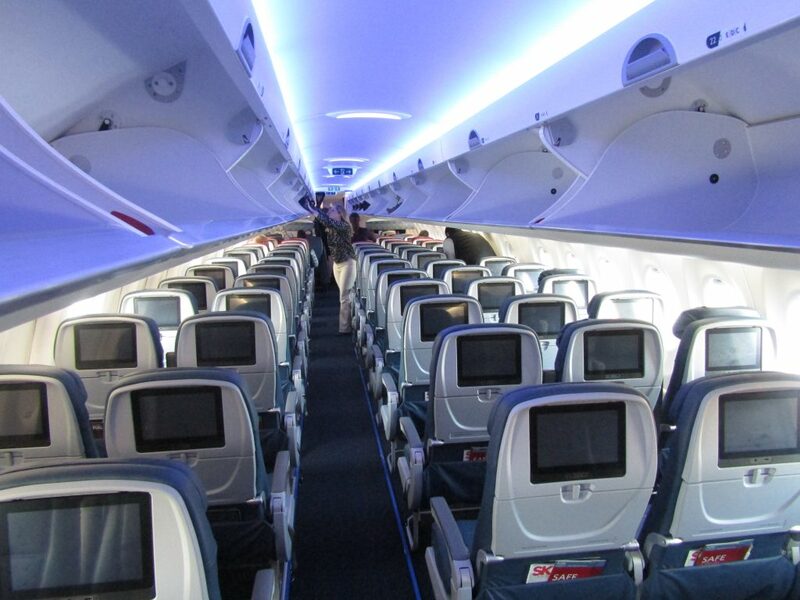 Up top, the aircraft features full-sized overhead bins for maximum storage space. 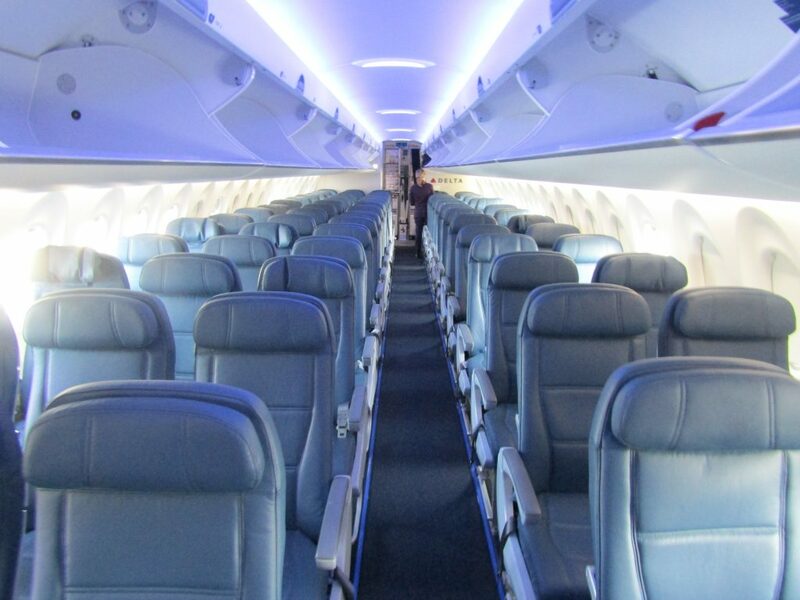 Directly above the seats, the air conditioning and flight attendant call buttons are also redesigned and relocated to allow for easier access and convenience. The buttons and air conditioning outlets are located above and slightly ahead of the seats instead of directly above for better angles. The aircraft also features colored lighting, with purple and white being the dominant colors onboard the aircraft. Arguably, the most exciting aspect of the A220 is the lavatory. 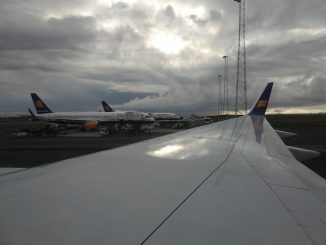 While the lavatory is the place where nobody on the aircraft wants to spend most of their time when flying, one might find oneself hanging out in the lavatory a little longer than expected due to a unique feature of the A220, a window in the rear lavatory. Only located on the rear lavatory on the left-hand side facing forward, the window allows those visiting the latrine to have a view while conducting their business. Since it’s located so far rear, the view is unobstructed and the window is the same size as in the cabin, allowing for a greater look outside. Since the toilet is located to the left of the window and faces away from it, it’s difficult to look out of it while sitting, however. 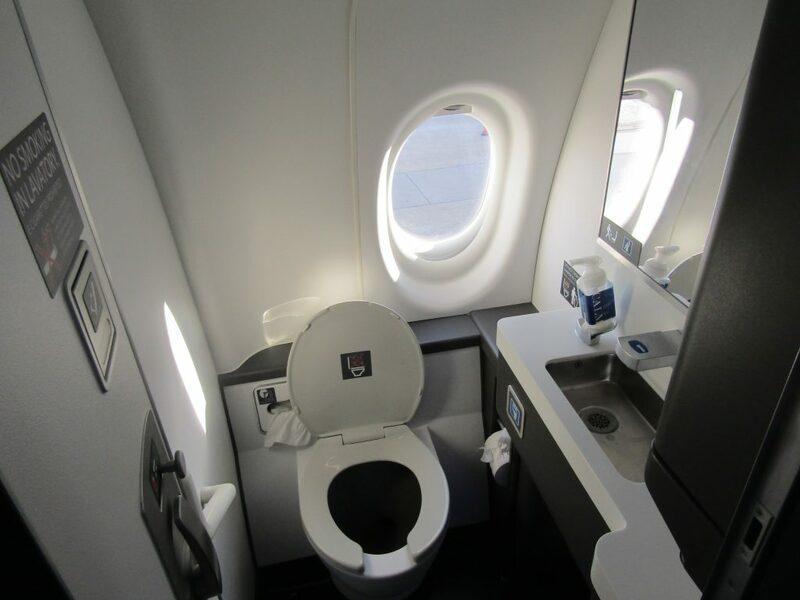 The window isn’t the only positive feature of the lavatory but does highlight its best features. The space is very modern looking and more spacious than normal lavatories. During the day, the window allows for natural light to shine in and allow for a more illuminated experience and highlights the additional space. 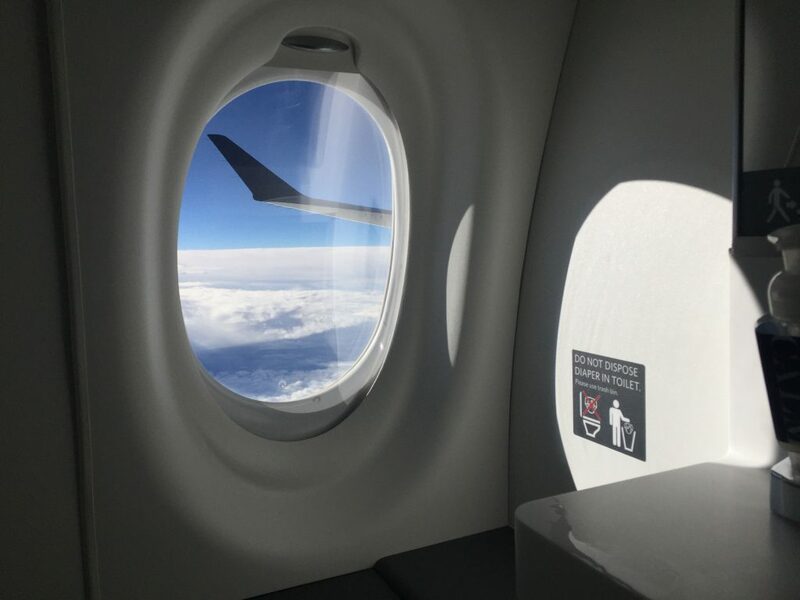 Fortunately, the window does has a shade like a normal window in the cabin to maintain privacy while in the air and on the ground. The other two lavatories, the others in the front and rear, do not feature the unique window. 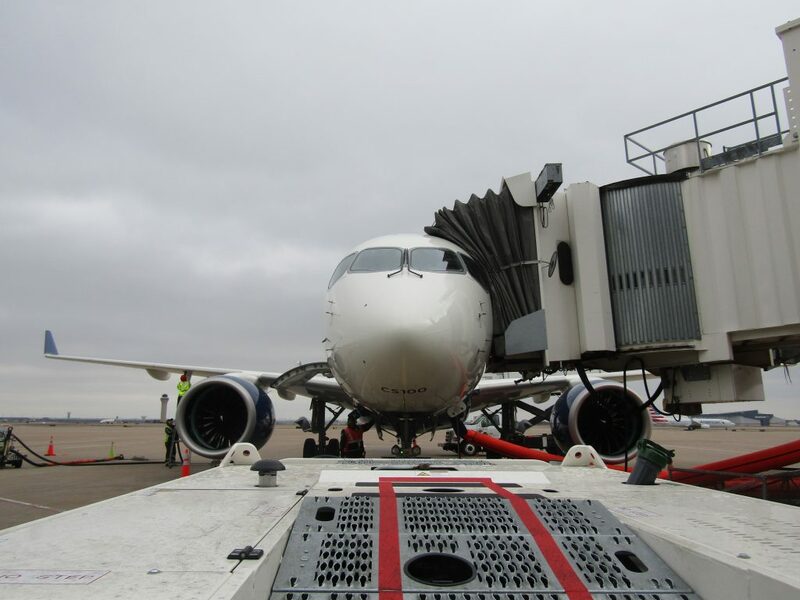 The induction of the A220 into Delta’s fleet, while a historic moment, is by no means the end of history for the ever-growing airline. 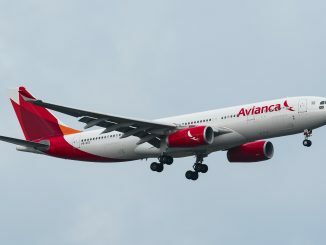 Although also rumored to be delayed by the government shutdown, Delta is expected to take delivery of the Airbus A330-900neo, currently in service with launch customer TAP Air Portugal, later this year. 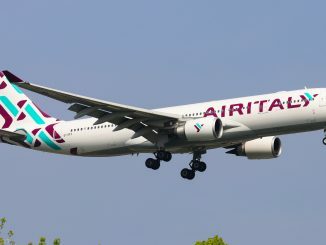 Although it wasn’t meant to be an Airbus order at the time, the use of the aircraft strengthens Delta’s relationship with the European aircraft manufacturer as some of the airline’s most recent orders and deliveries have been for Airbus’ aircraft, instead of rival Boeing. In addition to the A220, Delta also recently ordered and took delivery of such Airbus aircraft including the Airbus A321 equipped with Sharklets and the Airbus A350-900XWB, the airline’s new flagship long-haul aircraft.